Dear guys and gals, by now you must be very well aware of my sushi loving tendencies. But for all of you delicately challenged there’s an easy, equally delicious alternative. 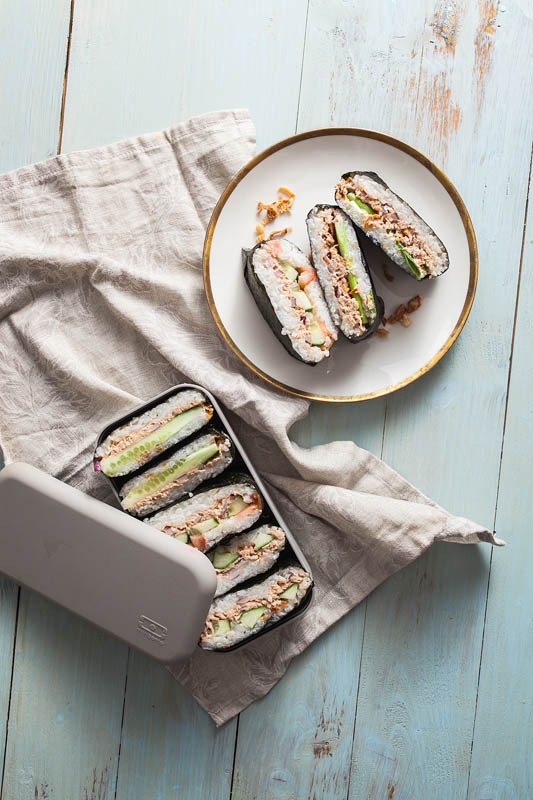 Onigirazu, Japanese rice sandwiches, are super quickly and easily prepared and a perfect snack for on the go. Well, and they are pretty. Japanese Food is awesome. Onigirazu have become one of my top travel snacks. The good old sandwich is all fine and well, but to be honest, most of the time I don’t even have bread at home, so why bother buying some before I’m off to new adventures? Apart from that Onigirazu offer such a great variety of stuffings and they are safely secured between rice and nori. You can cook the rice the evening before your trip and prepare the onigirazu freshly before you leave. 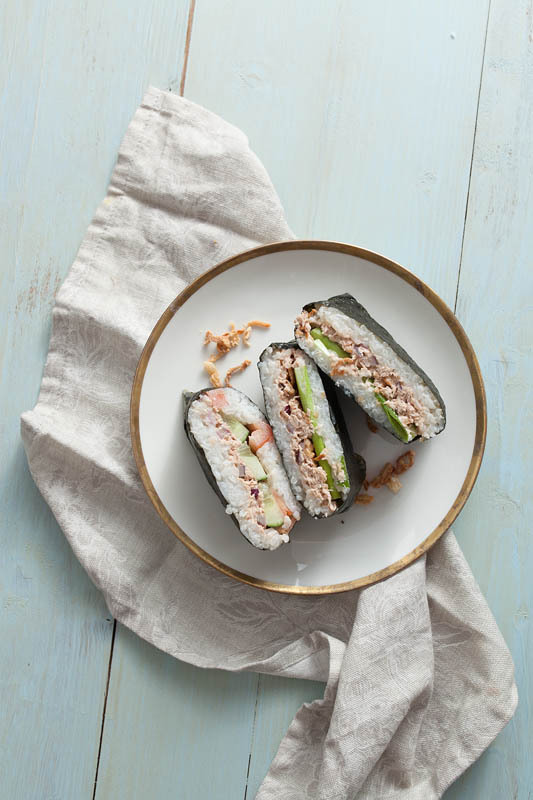 In case you’re not a morning person or do have a tight schedule you can easily prepare the onigirazu the evening before and store them in the fridge. Note that the nori leaves won’t be crunchy anymore, but it’ll still taste great. Most of the time I can recommend adding some fresh and crisp lettuce. For a good start I brought you some spicy tuna onigirazu, which can be quickly prepared and adjusted to taste. I’ve been a little bit crazy about canned tuna recently, so you are the ones who have to deal with it. Not that it’s a big sacrifice. Combined with chili mayonnaise and crunchy, roasted onions it’s hella delicious. Onigirazu are much easier and faster to prepare than sushi, however, it still requires some time and practice. 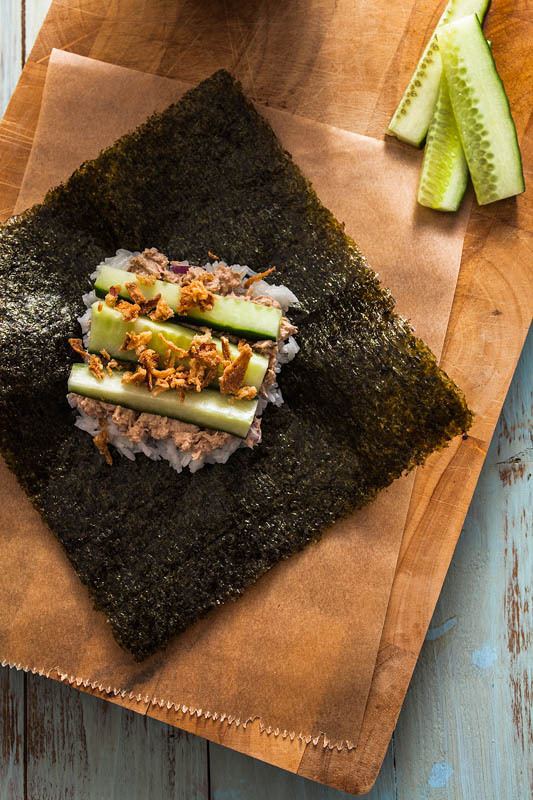 It’s important to give the nori some time to become a little soft and bendable once its around the rice.The rice is placed in the middle of the nori and topped with the stuffing. On top you have another spoon ful of rice which you press down carefully. The Nori is then folded from two opposite sites, just like an envelope. Let that sit for a little while before folding the two other corners over, while making sure that no rice is leaking out. Turn the Onigirazu over and let it sit until it keeps its form. 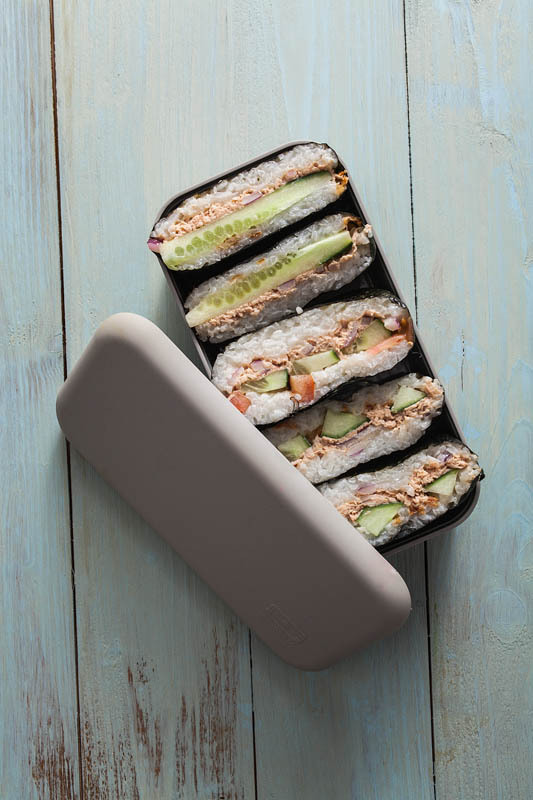 You can now cut it in half and store it in a bento box or lunch box or wrap it in sandwich paper. If you have trouble folding, you can take some plastic wrap for help. Rinse the rice under cold water until the water stays clear. Add it to a pot with water and bring it to a boil. Turn down the heat immediately and let it soak for about 12 minutes. Mix rice vinegar, sugar and salt and add it to the rice. Let the rice cool down before you place it on the nori. It shouldn't be hot anymore. Peel and mince the red onion. To a bowl add the canned tuna, onion, mayonnaise, soy sauce and chili sriracha and mix it thoroughly. Cut the tomato, cucumber and spring onion into slices. Place the nori with on corner facing towards you. 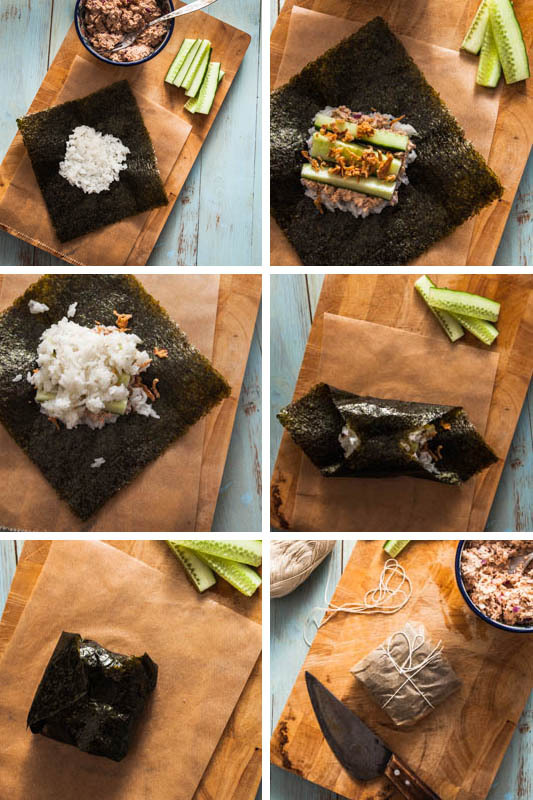 Spread about one tablespoon of rice in the middle of the nori and press it into a square, flat shape carefully. 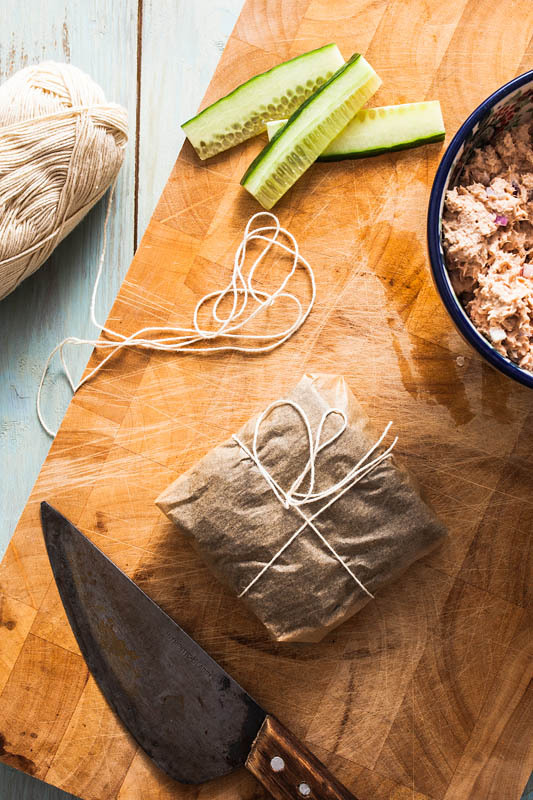 Spread the tuna paste, tomato, cucumber or spring onion on top and top it all of with another tablespoon of rice. Press it all together carefully. With time you will get a feeling for the right amount of rice and filling to be able to fold the nori properly. The Nori is now folded from two opposite sites, just like an envelope. Let that sit for a little while before folding the two other corners over, while making sure that no rice is leaking out. You can store your Onigirazu for about 1-2 days in the fridge.